First prepare the Masala Vada. Coarsely grind rest of the Chana dal. Finely chop the onion, dill leaves, coriander leaves and curry leaves and add it to the ground Chana dal. Heat oil in a kadai. Make small balls out of the mixture and flatten them. Deep fry on medium heat on both sides till golden and crispy. Mix yogurt, besan and all the powders and whisk well. Sauté for a minute. Add the yogurt mixture. Cook for sometime until it thickens, stirring continuously on low flame. You can add a little water if you don’t want it too thick. 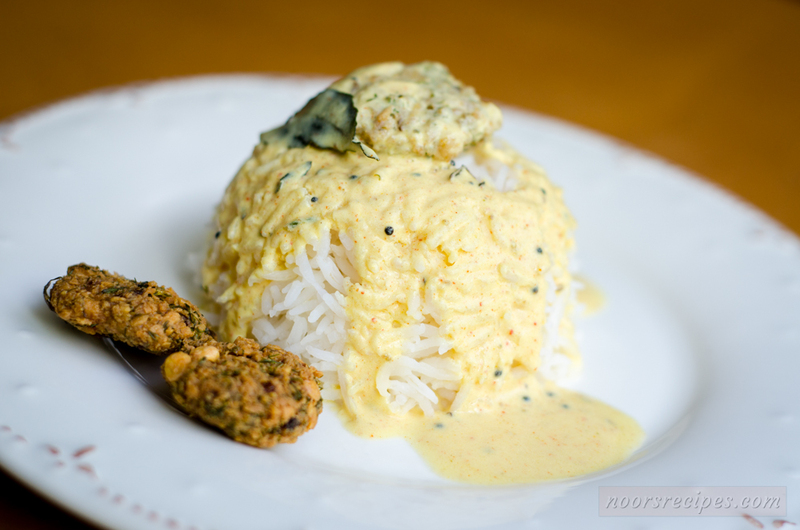 Once the kadhi is done , add the Masala vada and serve immediately with hot rice. This entry was posted in Vegetarian and tagged evening snacks, fried snack, masala vada, snacks, vada. Bookmark the permalink. Why did I never think of this? Beautiful.